"Where did all the pictures go?" If you're one of the dozen people who have asked me that question in the past few days, consider this your answer. The last few days of the trip were jam-packed with events...and it's unsafe to blog while driving...and one of our cameras broke...and the dog ate my homework. Choose whichever excuse works best for you. Loading the bus - ready to serve! Lost... that was what I was at the start of this trip. As some have noticed we started our trip a few days before the Youth Gathering started. We were doing our yearly trip to Jackson, Mississippi. The trip was going wonderfully... until a few particular hard questions came up in discussions. While I was trying to think of my answers I realized I didn't know what to think and I found that I didn't know what to think because I didn't know who I was. It wasn't amnesia. I knew my name, age, address, family... everything about me... everything but my face. I couldn't picture my face in my mind... I started to get scared and even more confused. When I thought of the others around me I could see their face, remember their actions, hear their voice... but when I thought of myself I could only see my hands and feet, my arms and legs. Only the portions of me that I don't need a mirror to see. As I was trying to muddle my was through this confusion I didn't want to be alone, but I started to become more distant from the group... the group wouldn't let me go. As we arrived in New Orleans the sleeping arrangements were different from those we had in Jackson, so I had new roommates. Due to the new roommates I got to know people better than I did before the trip, but I still didn't completely know myself. And the simplest of actions held me together, holding hands as we traversed the crowded streets around the dome and convention center, hugs (even when they were to comfort another), late night talks, etc. I knew I was lost before I came on this trip. I was hoping it would help me find my way back to the light... it did. Even though the people around me didn't know what I was trying to deal with they were helpful by just being themselves. The goofy guys who provided comical relief, the girls who know how to hold deep and meaningful conversations, and the leaders who kept us all together. While we were in the interaction center we interacted with one another as well as the other groups with us. We kept mixing up the groups depending on what we wanted to do. The gathering helped us break down some of the walls in the group. The Gathering provided an opportunity to worship with 36,000 people... that is an experience I would jump at the chance to do again. My epiphany came as we were worshiping. The Bishop told us a story about how his daughter had a time in her life were she was being torn by two halves, her white friends and her black friends, she was scared too. He then told us that we needed to remember our baptism, for in our baptism God claims us as his children. It was after this that my eyes started to get watery. I realized that what I had been looking for wasn't a face that I could see in a mirror. What I was looking for was a new path to God. I remember that in the faith statement I wrote in ninth grade I wrote something like: I know God will always be with me in my times of doubt, and will welcome me with open arms when I find him again. Today at worship he welcomed me with open arms that I gladly accepted. The Gathering has been so much more meaningful to me than I had ever expected it to be. From the interaction center to our day of service, the dome events to talking with the people of New Orleans, and the final gathering to worship. Before the Gathering I was waiting for God to find me, but now I know he never lost me, I was the one who lost myself. Now as I picture myself in my mind I don't see images only of my hands and feet. I see a child of God who lost her way, but now she is wrapped safely in his arms. She is no longer lost, wandering on unknown paths. She has found God's grace. The Servant Learning day made the most impact on me at the ELCA National Youth Gathering. The first couple days, I loved experiencing the huge, mile-long interaction center, 37,000-person Superdome, and abounding city, but I felt like those events were mostly geared for my enjoyment, to build me up. Speakers continually thanked us for being here, and our group of 12,000 had not yet done any service. I anticipated Saturday. Our service project was with an organization called Green Light New Orleans, which provides free CFL light bulbs to lower-income neighborhoods in order to be more energy efficient and produce less carbon dioxide. This saves people a great deal of money on purchasing light bulbs, as they last 5-7 years, and on their monthly electric bills. As the name alludes, these compact fluorescent lights also preserve the environment by contributing less to greenhouse gases and climate change. Think about it – not many people I know that live near me back home would be open to four teenagers and two adults walking through every room of their houses, seeing how they live, even if it was to give them free stuff. (We install the bulbs). We can tend to be self-conscious about messes or overprotective of our material belongings. We’d rather take the easy way out sometimes, rather than make a change, even if it’s for the better. My house in Iowa still has regular incandescent light bulbs, either because we did not know the depth of the benefits of CFLs, or we were just not willing to spend the extra dollar to make a positive long-term change. Overall, this fun experience helped us bond with the people and each other while directly benefiting them and the environment. It also taught us to be open to improvements and support of others. In the spiritual sense, it was cool to literally spread God’s light to the world. Along with the physical help of the new light bulbs, I hope the people can respect the kindness of our Christian group and know that we truly want to help. I hope they can feel the love, which is first the love of Christ shining through us. Slowly we can hopefully take away the hypocritical Christian perspective that some have and bring them to Christ too. “May they see your good works and praise your Father in heaven.” –(Matthew 5:16) Works also grow us, as Christians, because we must act selflessly for others and we therefore become more like Jesus. Philippians 2:1-8 were some theme verses for the Gathering, continuously scrolling across a screen in the dome, reminding us to live humbly like Christ, placing others before ourselves, in order to live for God. On Sunday we heard the story of Jesus’s miracle of Feeding the Five Thousand with five loaves of bread and two fish. Andrew and Phillip did not give up, and Jesus worked a miracle through the little they had. In the same way, God still uses us today. No talent or effort is too small for God to use to serve His people for His glory! Isn’t that awesome? If we come to Him with the little we have, such as one day of service in New Orleans, He can make more great things happen as a result, encourage more people to act, or change lives forever! So let’s go out, with our one light bulb, shining with the everlasting power of Christ, not only for 7 years, but for eternity. P.S. The “Found” blog touched my heart – I’m so happy for you!! God is amazing! He is Life! Amen! Our young people have some marvelous stories to tell from our Servant Event day with Green Light New Orleans! How many Lutherans does it take to change a light bulb?... How many times have we all heard that one before... but what I want to know is how much does the simple act of changing light bulb affect people? Today during our day of serving we were told that we were going to change light bulbs in apartments for Green Light New Orleans, not many of us were completely thrilled with the idea, but we soon warmed up to the task after the realization hit that changing light bulbs can help a home owner with the amount of energy they consume but also help the environment. The small group I was a part of met a very kind elderly lady. Our team adult sat with her chatting, while we busily scurried around changing her lights. We changed a total of 32 lights in her house. We replaced the old bulbs with new ones that would last for five to eight years. Over the period of five years those seemingly insignificant bulbs will save her a little over $1400 ... 32 bulbs that would cost an owner around $80 to purchase would save so much more. Those bulbs won't only save money, they also cut down the amount of energy that is wasted by normal bulbs and the amount of carbon dioxide produced. But what was most meaningful was the kind lady's face after we told her what those 32 little bulbs would do. I never thought that by changing a light bulb could make such a difference in the world, and change the lives of others around me. So when my church group found out that our service work was going to be screwing in light bulbs, we were like, "what the heck!?!? What can we accomplish by screwing light bulbs?' But sitting here now I have never been happier to screw in a bunch of light bulbs. Because by screwing in those light bulbs myself and many other people were able to meet and connect with some really amazing and giving people. Also by screwing in those light bulbs we were able to help alot of people save hundreds of dollars. I just don't know how to express the emotions that I felt today by bonding with those people. I just want to thank Green Light New Orleans so much for bringing the group together to meet new people. Also by having this non-profit organization donate the free light bulbs, and help thousands of people save a lot of money. Thank you so much Green Light New Orleans!!! 38,000. That’s lot of Lutherans! You’d think that that would be overwhelming right? But it’s surprisingly the opposite, it’s humbling. When you live in your own little town of Des Moines in my case you feel powerful and important, but when you enter the Superdome and see all those people singing, dancing, and praising you feel so small. You feel powerless and unimportant. You feel like nothing. But then I remember that God doesn’t care where you come from, who your with, or how you praise. All he cares about is you, good old Iowa living corn picking you. These past few days have been unexplainable. I’ll go home on Sunday and try to explain this week but I know I will be unsuccessful. You can’t feel what we’re feeling unless you are here which is a shame because the love and the security that I’m sure everyone is feeling (although I can’t speak for them) is unimaginable. Everywhere you turn there are kind hearted, loving Lutherans who welcome you with open arms. But I think this city would be this amazing with or without the Lutherans. Before the disaster they were residents of the same city, afterwards they are an extended family. They welcome anyone and everyone. Walking through the streets of Des Moines you feel welcome, but when has a complete stranger stopped you and thanked you for coming to their town? People will tell you their life stories in the middle of the street, and to most people that would seem distracting and just another thing that slows their busy selfish life down. But I have not found one selfish person here or in Jackson. This town has literally made us their own, and that is the most amazing feeling. Coming into a city for 4 days and becoming practically a citizen. Not only is this city amazing but this convention is amazing. They have gathered the best of the best (and I’m not just talking about the Lutherans). The speakers that we get to hear every night are truly amazing. They are changing the world every day and getting everyone to join them city by city. They have made me believe that I can do the impossible. I can change the world, even if it’s with small acts. I don’t have to be old or powerful or even have to live in a big city. I can change the world from Johnston, Iowa. I can change the world at 17. The world can be good one day, I truly believe that. The world can be at peace. There can be justice in the world. And most important of all… everyone can love each other. I can say firsthand that I have been in a room where I felt love coming from over 38,000 people. How many people can say that?! (I mean besides the more than 38,000 people that were in the room). God has made an amazing world, and amazing people to be in it. And I hope and pray that the almost 7 billion people in the amazing world we live in will one day come together and make this world a place of justice, peace, and above all else love. We spent the day in the Interaction Center, exploring issues of Wealth & Poverty. There are so many amazing things to do in this space! The young people in our group are growing increasingly enthusiastic about being the change they wish to see in the world. They're also inspired by the witness of the other young people they're meeting. The highlight of the Dome event was the Skillet concert. Four of our boys had an opportunity to "rush the stage" and be up by the stage. The speakers were solid once again - each sharing their stories of overcoming adversity and using the negative events of their life to make a positive impact on the world. We're also enjoying the sights, sounds, and smells of New Orleans. It will be fun to see a different part of the city tomorrow on our service project. Today was our first full day at the ELCA Youth Gathering. As with any event of this magnitude, there were a few speed bumps in our day, but our group was patient and understanding...they are truly an amazing group of young people and adults! We spent some time in the Krewes Learning Center exploring workshops and integrators that caused us to reflect on the way we live out our baptism. I even ran into my folks (again) while we were exploring. We discovered (via a JJJ09 nametag) that my dad's first name is no longer Steve, but instead it has been changed to "Bishop". Oddly, it can be both a male and female name...and there are 65 other Lutherans with the same name. Who knew! A special treat for the group was lunch at Mother's. The food and the service were both top-notch. Lots of Ferdi's and po'boys with "debris" were ordered. As for me, the jambalaya and bread pudding sufficed. We spent some time wrapping up a few learning events and hanging out in the Interaction Center. From there, we visited the offices of the Louisiana Bar Association. One of our adult leaders has a friend who works for there. We went to hear the stories of a few employees who were impacted by Hurricane Katrina. They showed us unprecedented hospitality (sandwiches, chips, candy, soda, water, etc.) and let us sit in their amazing conference room with leather chairs. It was a profound event for all of us. Certainly a highlight for many!!! We sang, listened, prayed, and danced at the Dome event later that night. Many enjoyed hearing from Jay Bakker (Jim & Tammy Faye's son) -- an excellent articulation of God's love. If only he could have spoken longer! The hip-hop group Group 1 Crew rocked the house and sent us into the evening of Community Life events in several of the hotels. It was truly an inspiring and joyful day! We left Jackson in crowded vehicles and drove through the rain into New Orleans. Somewhere along the three hours on the road, the heat index increased 25 degrees. Ugh! The young people were astounded by the size and scope of this ELCA Youth Gathering. One of our adults put on Facebook "I'm in the Big Easy with 36,000 young Lutherans. The Big Easy is looking pastier and whiter than I remember it." A tidal wave of predominantly northern-states folks have washed over the city that was ravaged by hurricane and flood only four years ago. We are a part of the largest convention in the city of New Orleans since Hurricane Katrina. The Associated Press is calling Jesus ~ Justice ~ Jazz the "largest service ministry event ever attempted in three days". It's a joy to be part of such a significant event - both in the broad impact 300,000+ volunteer hours will have on this city AND in the intimate impact it will have in the lives of individuals. It was an emotionally moving day for many in our group. A couple of youth have asked to share a few reflections from our last day in Jackson, MS. When I got up this morning I was ready to do any work that God was calling me to do. I thought that I was going to be doing more yard work like we did the previous day. But God had a different idea for me. When we arrived at the church we were told there were some spots around the church grounds that people (homeless) were using as a bathroom, and that it needed to be cleaned up. I volunteered because i thought i could handle getting my hands dirty, and i thought i could handle the smell. But boy was i wrong. I had no idea that these places that were being used as a bathroom were also places were people were sleeping and living. The first spot we (Kendra B, Haley, Naomi, and myself) cleaned was a stairwell leading to the basement of the church. This was the major spot where people were relieving themselves. In the stairwell were also blankets, clothing and news papers. The smell was like the smell of a hog house, i couldn't believe that anyone would go down there, but we did. The next place we were told to clean out was a covered stairway leading into the church. What we did next has forever changed my outlook on life, and the lives of the people around me. On the stairway we found scary things like condom wrappers and rusty nails, but we also found clothing and unopened cans of food, basic things that people need to live. 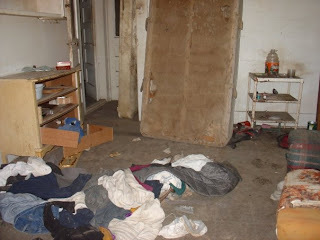 It was so shocking to realize that someone(s) was living here, and slept on dirty wet cardboard every night, and had to wear dirty clothing. But was the worst thing we found were Baptist devotional guide to life, and a workbook on how to read the Bible. So what was so sad was that this person was trying to have a relationship with God and Jesus, and yet they were living like they were. And what made me feel even worse was we were taking it all away. We were just scooping it up and throwing it away. I couldnt stop thinking "what was this person going to do when they came back and realized it was all gone?" I cant write anything to make anyone realize how emotionally draining what we did was. I just wanted to break down and cry. I just pray that whomever was living there, has moved onto a safer and cleaner place. And hopefully by us cleaning up there 'home' they went to a homeless shelter or somewhere with a warm dry bed, and a warm meal. Going into this trip I didn't expect what I am feeling. I ignorantly expected it to be just another work trip. But through the sights I've seen, the people I've met, and the conversations I've had my thoughts are not what I went into this wanting to feel. But life isn't always what you want is it? Throughout my christian education since I was young I have always been told that it is okay to doubt your faith, but I have never really liked that. Although I really wouldn't call what I am feeling doubt, I would call it questioning. I'm questioning if my faith is enough. I'm questioning if I'm doing enough to help. The people here are amazing. The sights here are amazing. The south looks like Iowa but doesn't feel like Iowa. When the group took a walk throughout the neighborhood people would stop what they were doing just to say hi to us and to have a genuine conversation with us. After spending 4 days in Jackson I know I have had an experience that I will never forget. I will never forget the people, the sights, the thoughts, or the God that sent me here. 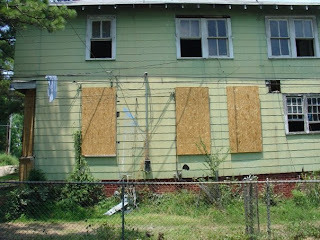 Monday was our group's first of two days of work projects through VOCM in Jackson, MS. Many of us were excited to return to Claiborne Park to pick up trash, trim brush from a large fence line, and mow the grass. Claiborne is a 16-acre park that was given by the Baptist Medical Clinic to VOCM for the purpose of making it a safe place for community events to occur. There are several walking trails and a few benches in the park. We met several people from the adjacent apartment complex. One young boy even offered to help with the project, which was encouraging. The day concluded with a neighborhood BBQ at the Study Center house. Afterwards, we had excellent theological conversations among many in our group that lasted late into the night. Wendy is the aunt of one of the youth on our trip. Oddly enough, her niece was reading Wendy's soon-to-be-published book and came across this quote about koinonia...and, as irony would have it, she shared this quote with me while sharing a smoothie at the Koinonia Coffee Shop in Jackson, MS. 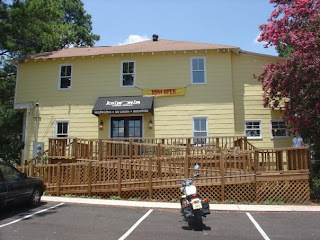 The coffee shop was a condemned building located next to an abandoned church. Five years ago, a group from Windsor Heights Lutheran began work on transforming that house. Today, the abandoned church has been transformed into the central headquarters of Voice of Calvary. The condemned house has been restored - the bottom level is the coffee shop, and the second level is where the owner and her husband live. It's an amazing change; one that has brought life into an economically depressed area of town. I reminded of the koinonia that is being created within our group of 23. I also reflect on the koinonia we have shared with Voice of Calvary Ministries. Over 75 sets of hands from our congregation have worked near this place in the past 8 years. In our attempt to be a blessing to the people of Jackson, WE are the ones who have been inspired and blessed by the ministry of our partners at Voice of Calvary. God is truly present in a special way in this neighborhood...and we are fortunate to be a part of the koinonia that this partnership brings. Here are some fun pictures from our 16-hour road trip from Des Moines, IA -- Jackson, MS. We have 17 youth and 6 adults on our journey to Voice of Calvary Ministries (Jackson) and the 2009 ELCA Youth Gathering (New Orleans). Haley (left) has been working at camp all summer! A while back, I wrote a blog post about how we are called to "Be John". If The Baptizer is our New Testament role model, allow me to suggest that Amos is our Old Testament fella. Here's a man who doesn't appear to have any aspirations beyond taking care of trees and sheep. In other words, he's a man who is just trying to faithfully live out his vocation. When God comes calling, he doesn't put on airs or pretend he's suddenly become more important than those around him. He simply does what the Lord asks, forsaking the familiarity of what he has known his entire life. Amos, a book of the Old Testament, is the third book of the Minor Prophets. It takes its name from the prophet Amos who lived c. 750 BC as a shepherd at Tekoa in the southern kingdom of Judah. It was to the northern kingdom of Israel, however, that his prophetic message was addressed. Writing during a time of prosperity, when a sharp contrast existed between the luxurious life of the nation's leaders and the oppression of the poor, Amos preached the urgency of social justice and the threat of impending divine judgment. I'm hoping to encounter a 21st century version of Amos this week as I travel with a group of youth and adults to Voice of Calvary Ministries in Jackson, MS and the ELCA Youth Gathering in New Orleans, LA. The overarching theme of our trip is "Wealth and Poverty". My prayer is that our 23 youth and adults will be confronted with the chasm between the poor and wealthy in our world. I pray we will come to realize that the people our suburban Midwest group are almost always found among the rich and comfortable; whereas God is almost always found among the poor and oppressed. Who will be our Amos this week? Some members of my family grow tired of blog posts about churchy stuff...they want pictures and cute stories of the kids. Fair enough. I've uploaded some other pictures onto a Facebook photo album. You should be able to find them here, even if you don't have a Facebook account (Krista). Back in the day, when I was a paperboy for the Waterloo Courier, people who went on vacation would have two options. Temporarily cancel their subscription until they returned from their trip...or, place a "hold" on their subscription. Holding meant that I had the opportunity to stack the customer's newspapers in my parent's garage until they returned. Once the customer was back in town I would deliver this large pile of papers to the subscriber's house where, I assume, they poured over the news of the days they were on vacation. This never made sense to me as a kid. What's the point of reading old news? Fast forward 18 years. I just got back from a week of vacation. 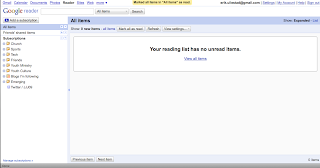 Upon opening my Google Reader, I discovered 1000+ articles that were unread. I started skimming through the articles to see what all had happened in the world since I had unplugged. After spending 30 minutes, and barely making a dent, I did something I've never done before. I clicked the "Mark All As Read" button. I have spent most of the day since then wondering what I had deleted. What free youth ministry resource did I miss out on...what life-changing sermon did I neglect to read...what amazing application for Mac or Blackberry was left undownloaded? I've become a "put-the-newspaper-on-hold" guy. And it drove me nuts to temporarily cancel my subscription (a.k.a removing these articles from me rss feed reader). It turns out, I'm more intrigued by old news than I thought I would be. Maybe I'm just nosey...or I have an insatiable quest for knowledge...or, perhaps, I just like being in the know. All that said, judging by the level of consternation I experienced today, I will probably not be hitting "Mark All As Read" any time soon. Are you going to be "tweeting" during Jesus ~ Justice ~ Jazz? Leave a comment with your name and Twitter handle.